Just as the name of Marcel Proust is often mentioned along with a reference to the French cookie/cakelet, madeleine, the name of Maria Guyomar de Pinha (Thao Thong Kip Ma ท้าวทองกีบม้า) is almost always invoked at every mention of Portuguese-derived desserts which had been assimilated into Thai cuisine. All this took place in the reign of King Narai the Great (สมเด็จพระนารายณ์มหาราช) — the period in 17th century Siam wherein foreign influences abounded politically, linguistically, culturally, and, in this case, culinarily. Maria Guyomar de Pinha is said to be a Japanese-Portuguese woman who made a definite hand print on the Ayutthaya royal court kitchen, an influence that is still in effect today. Despite the enduring legacy, so very little about the woman is known. While certain aspects of her life have been documented, much information that is in circulation remains unsubstantiated. The little we know about this woman is fascinating, though. I’ll talk more about the woman whom the Thai refer to as Thao Thong Kip Ma in future posts. For now, let’s focus on one of the desserts which she supposedly introduced to the Siamese court: khanom1 mo kaeng (ขนมหม้อแกง). I doubt that anyone really knowswhat exactly the prototype of Khanom Mo Kaeng consisted of. However, with it being essentially a custard, one of the egg-based desserts that were introduced to us during the Golden Age of Ayutthaya, one can venture an educated guess that it was fashioned after a dessert originally made of eggs, milk or cream, sugar, and perhaps a starchy element of some sort. Adapting the western custard to 17th century Siam, Maria Guyomar de Pinha had substituted several locally-available ingredients for those traditionally used in the West, e.g. duck eggs for chicken eggs, coconut milk for milk or cream, and palm or coconut sugar for cane sugar. True to form, when the Thai incorporate a foreign dish into their cooking repertoire, they add some local touch to it. 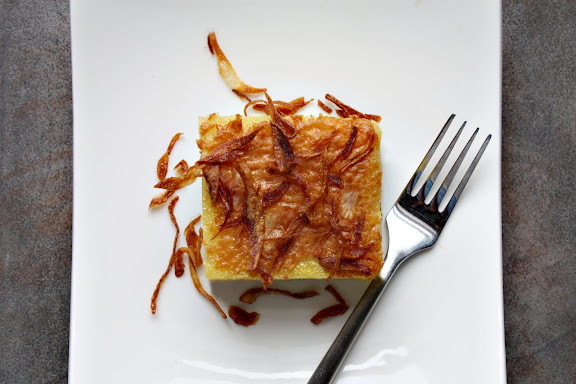 Topping a dessert with crispy fried shallots (the same used to garnish Thai southern-style fried chicken), a component that is generally considered savory, seems unusual. And it is. Even in the Thai dessert repertoire which not only tolerates but also relishes such flavor pairing, I can count with one hand sweet dishes in which crispy fried shallots show up. To many of us, the subtle savoriness of the fried onions complements the sweetness of the custard so well, and what seems like a garnish to many is to us an essential part of the dish — so much so that when we come across some versions of Khanom Mo Kaeng that have no fried shallot topping, they appear naked, incomplete — inadequate. 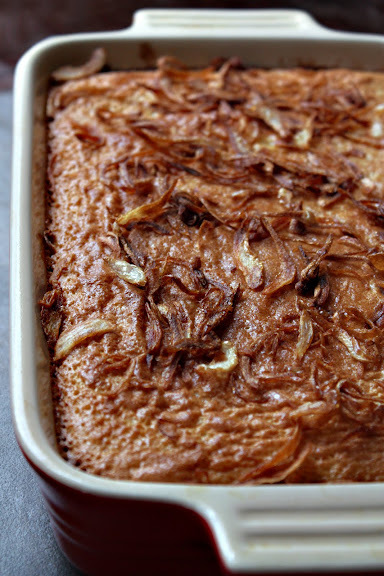 If you’ve never had a dessert that has fried shallots in it, you may feel apprehensive. In the end, your apprehension may be confirmed, and that’s fine. But since this experiment requires no more than a shallot, some oil, and less than 10 minutes of your time, won’t you give it a try? 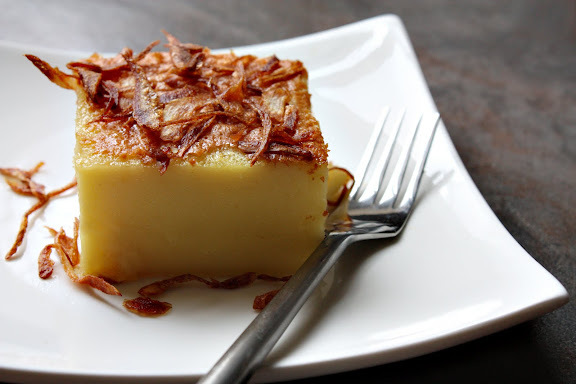 Take a little bite of the custard with some of the fried shallots to see if you like it; if not, keep the remaining shallots to use in something else and enjoy your Thai custard plain. But if you find yourself liking the custard with fried shallots, then you’ve just discovered a new food combination that some of us have adored for so long. Just like the western dessert, flan, Khanom Mo Kaeng comes in many different versions that are slightly different. Some versions, containing no or very little starch, are more eggy, delicate and flan-like (Khanom Mo Kaeng Khai ขนมหม้อแกงไข่); some versions — such as the one featured here — are firmer and starchier in texture, almost like fudgy brownies. Both are great, although the starchy versions are much easier to make. Different people have their preferences on the choice of starch. Though it seems the most popular choice of starch by far is taro (Khanom Mo Kaeng Pueak ขนมหม้อแกงเผือก), hulled mung beans (Khanom Mo Kaeng Thua ขนมหม้อแกงถั่ว) or lotus seeds (Khanom Mo Kaeng ขนมหม้อแกงเมล็ดบัว), among other starches, are also quite common. Judging from what I’ve used in this recipe, you can guess which of these starchy ingredients is my favorite. Interestingly enough, I’ve found that most of my Western friends don’t like the texture of beans in this (as well as in several other Asian desserts). If you don’t like bean-y desserts, feel free to use cooked sweet potatoes and call it Khanom Mo Kaeng Man Tet (ขนมหม้อแกงมันเทศ); I’ve done so numerous times and been pleased with the results. Put the shallot slices and the oil into a small frying pan and heat up both gently on medium-low heat. Stir the shallot slices around, breaking them up as you go, until they’re golden brown and crispy. (Do not crank up the heat in an attempt to speed up the process; you’re just going to burn the shallot pieces before they become crispy.) Transfer them to a paper towel-lined plate; set aside. Reserve the remaining oil. Use some of the oil to grease the bottom and sides of a 9×13-inch baking dish. If there’s still any oil left, reserve it. Soften the palm or coconut sugar as instructed here. In a blender or food processor, blend together the cooked mung beans, eggs, sugars, salt, and any leftover shallot oil, until smooth. Let the custard mixture rest for 5 minutes until it becomes less frothy. Pour the custard mixture into the prepared pan; place the pan on a rack position in the upper third of the oven. Bake for 35-45 minutes or until the center is slightly firm and the top is golden brown (see note #2). Sprinkle the fried shallots over the top of the custard. 1. 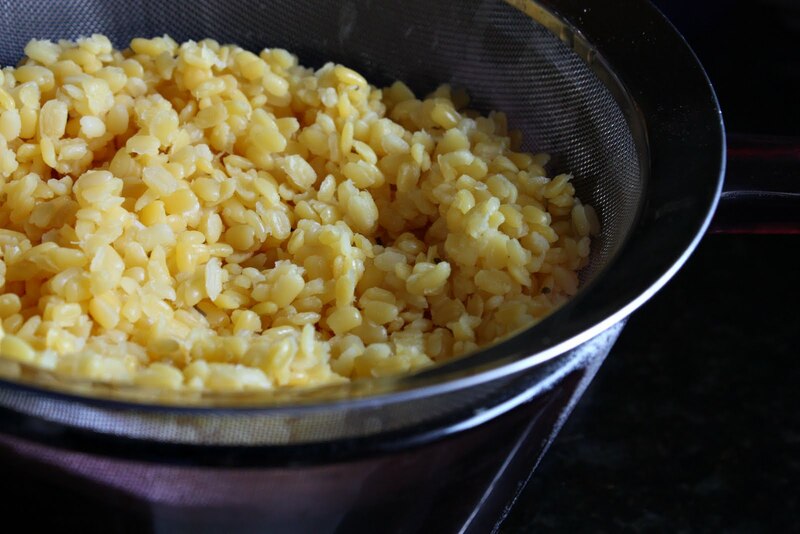 Take about ¾ to 1 cup of uncooked hulled mung beans and boil them in water as you do pasta until they’re soft. When you squeeze the grains between your thumb and forefinger, they should easily turn into a paste. Drain them well and measure out 1½ cups to use in the recipe. 2. Thai food authority, Chef McDang, bakes his Khanom Mo Kaeng in a water bath (bain marie) as explained in his book, The Principles of Thai Cookery. The water bath is key in creating an environment in which the custard is cooked evenly and at a steady temperature thereby preventing a crust from forming around the edges and hardening before the interior is fully cooked. This is the standard custard protocol and you can certainly do that. However, I have found that baking Khanom Mo Kaeng the way it is commercially done in Thailand, i.e. without a bain marie, results in a custard with firmer texture and darker exterior which I like. Plus, I’m lazy. You do what works better for you. 1 Khanom (dessert, snack) Mo (pot) Gaeng/Kaeng (curry) literally means “a dessert made in a curry pot — most likely the only baking vessel available in 17th century Siam (in the present days, the dessert is commercially prepared almost exclusively in square aluminum pans). The name is also transliterated Khanom Mo Kaeng, Khanom Mor Gaeng, Khanom Mor Kang, or Khanom Mor Gang. Leela, this thai custard sounds delicious, love the addition of fried shallots there. i’m totally unfamiliar with this kind of preparation, but it looks really interesting to me. can i get just a bite to try? Leela, I am so intrigued by the flavors you’ve presented with this amazing sounding dessert. What a great story, and how interesting the translation of flavors. What an interesting recipe. never seen anything like it, but we do have sweet mung bean uses in Chinese cooking so I think I’d like it :). I really liked your write up about this dessert. I have never thought of using sweet potato to make this but thats a wonderful alternative. Thanks for all the information. I’ve had this with strips of coconut instead of the fried shallot and it was very good. I’ve always avoided the one with shallot, but I guess so many millions of people can’t be wrong. Maybe I should close my eyes, open my mind and give it a go! Life was tough for my mom growing up. I made her re-live it by writing her story. In the end it was for her an for us kids. The question ‘if there is only one thing you can take with you….’, her journal will be it for me. One of the many things she had to do when she was around five years old was to make desserts to sell. Her mom got all the kids up at 4 AM. She was the second oldest. There were no mod con back then either. She didn’t like it that she couldn’t just go to school but she had to sell desserts to her friends,teachers and neighbors. Day after day it went. My mom cooked without recipes. (That’s my next project to compile that and take a thousand more photos of her food and her making them.) The cook-to-sell experience was nowhere near fun for her. ขนมหม้อแกง was one of those desserts she had to make. I really don’t remember her making a lot of dessert for us growing up. She knew the best one to buy at the market. So it was my first time to try to make it after reading your post. It was FANTASTIC! It was SO EASY! Mom, that wasn’t a bad childhood. What are you talking about? nooami – Wow. Just. Wow. Thanks so much for sharing your mom’s story with us. I can’t even imagine what it’s like to hull the beans manually, extract coconut milk, and get the charcoal started every morning! Bless your mom’s heart! I like your idea of trying the shallot on part of the custard, so you can test whether you like it. It’s a good fusion of asian beany desserts and European custardy ones. I look forward to hearing more about a Japanese Portuguese lady in a royal Thai kitchen. Hi Leela, love your blog. I am in south FL and my local Thai resto makes a version of this using grated cassava. It is one of my all time favorite desserts. I can’t wait to make yours. Oh, Leela… I’m in South Florida too. If you ever come here, please let me take you out to lunch! I’ll take you to all the fabulous places I know! I have been searching for years for this recipe. The Thai shop were I used to get it doesn’t make it anymore. Thanks for posting. I will definately try to recreate this delicious sweet. I just ate this this evening. I live in Chiang Mai. Came to the internet to find out what is in it—I’m on a new no gluten kick and am now happy to learn this has no gluten! Thanks. My question is, is there a difference between Moh Keang and Sankaya? Both are coconut custards and on some websites the recipes seem almost the same. But I remember Sakaya as something I ate on top of sticky when I was a kid. Am I all confused and totally wrong? Nuntiya – Not much. But even though they’re very similar, they’re hardly confused with one another — kind of like a cake and a muffin. I’d say it’s more common for mo kaeng to have a starchy ingredient in it than sangkhaya which is almost always made with just eggs, coconut, and sugar. Also, you’ll never see sangkhaya served with fried shallots on top.